Road Less Travelled: Basgo Ruins Of A Bygone Era! Basgo, once capital of Lower Ladakh, was a political and cultural center and now overlooks the ruins of an ancient town. The Basgo Monastery was built by Namgyal rulers in 1680 on top of a clay hill. Later on a castle, also known as Basgo Rabtan Lhartsekhar, was built by the father-son rulers Dharamraja Jamyang Namgyal and Singay Namgyal. The entire castle is now in ruins and only two temples stand today. Of what remains the massive Maitreya Buddha statue, natural color paintings on the walls, centuries old thankas paint a beautiful tale even today. The folks inside the temple were making miniatures religious offering using clay and butter and some of the offerings were getting a fresh coat of bright red paint. This historic monument offers breathtaking views of the surrounding hills with different shades of colors. It was really disheartening to see that there are not many visitors to this spectacular sight providing an insight into a bygone era. Soaking in the views for one last time, we continued our journey to Leh. The road to Basgo ruins adds on a dash of adventure. En-route on the highway, very close to saspol we really enjoyed our breakfast. We had one of the best maggie thanks to the homemade masala they added. Also, we had "Maiyas" fresh badam milk that was free off any preservatives, artificial flavor and color and had plenty of real crunchy badam flakes. 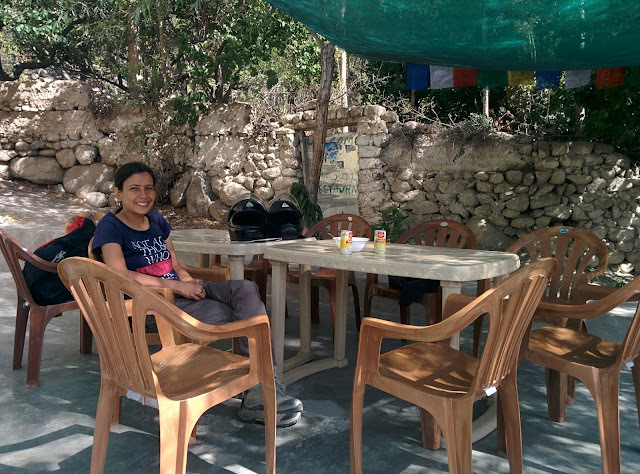 One thing we consistently noticed and were in awe with across Ladakh and Ladakhi business was their absence for greed. At every purchase, no matter how remote the village was or how small the business was, we were charged only on MRP every single time especially "In remote corners such as Diskit, Suru just to name a few." In such locations, we totally understand if they would charge us a few more rupees. We were so impressed by their ethics when it comes to running a business. This was in stark contrast to what we come across in the city where from milk packet to bottle water "Cooling Charge" and other dismal reasons are given to charge customers more than MRP. It is not about a rupee or two but the cheapness that most of the businessman in the city go to to make a few extra bucks. Ladakh truly left a brilliant image in our minds. The entire stretch of highway is adventurous and memorable. Our deepest gratitude to BRO and several hundred others who have toiled real hard to build and maintain such amazing highway so people like us can have an adventure of a lifetime. It was such a joy to ride on these roads that we did the Kargil - Leh stretch not nice but twice and of the 230 km highway the best part in our opinion was the amazing stretch between Likir and Nimmo. The entire stretch had absolute stunning views of the hills and the lengthy stretch is free of any obstacles hindering our view. We simply stood there soaking the views and forever etching them in our memory. Thanks! I have read multiple travelogues of this region but this is the first time I have read about this temple. If we ever go back, we will visit here..
Glad you liked the post. Have a fun trip.